We don’t have many shoes (~3-4 pairs each? ), but the ones we have always seem to be in the way. Either they’re blocking the entrance steps to our RV (we don’t wear shoes inside) which means we often trip over them as we’re going in/out of the rig. Or, they’re lying in a mess in our back (bedroom) closet. And it’s been like this for years! So, what we needed was 2 simple solutions -> one for our bedroom closet and one for our front entrance. The solutions needed to be cheap, flexible enough to be able to fit into a small RV space & easy to install. What I ended up using was 2 types of hanging shoe organizers, both of which cost under $5 from IKEA. You don’t have to buy these at IKEA of course (you can find them elsewhere), but they’re just super cheap there. I bought two organizers, both called SKUBB ($4.99) one of which is a boxed/shelf-type and the other which is a flat hanging type. The first one I was able to install pretty much as-is, while the other I had to modify for our space (see below). They’re made of polyester, come in two colors (black and white) and depending on what kind of space you have in your RV, you could likely fit one or the other (or just do like I did and splurge a full $10 for both!). The cheap IKEA SKUBB shoe organizers I bought one of each! We were able to use the boxed/shelf-type organizer pretty much as-is by hanging it on the clothes rod in our back (bedroom) closet. It attached with Velcro and was a perfect fit depth-wise, but was a bit too long. So we simply bunched up the 2-3 boxes we weren’t going to use and clipped them together with some metal binder clips at the bottom (you could simply cut off any excess boxes too). The polyester has a little”grip” to it, so the shoes shouldn’t move while we’re driving. Voilà…shoes no longer a mess in the closet. NOTE/ For those wondering about the other stuff in our closet in that left-hand picture -> the tall thing standing in the front left is a Shark Rocket Ultra-Light Vacuum Cleaner (which we LOVE), and the two items in the bottom back are a dehumidifier (also LOVE…sadly our model is not sold anymore) and our ceramic space heater (another fav that we’ve had for over 6 years, the DeLonghi TCH7090ERD). The flat-type organizer we decided to use in the front of the RV. For those looking to implement a similar solution any flat wall space will work for this (e.g. under your bed, in the corridor etc. ), and since the SKUBB is super easy to modify you’ll be able to fit 4 or more shoes just about anywhere you please. In our case we had a slice of wall right by the entrance next to our passenger chair that was the perfect size to fit a single row of shoes. So, I decided to modify the SKUBB by cutting & reinforcing it to make a nice-looking 4-pocket holder. Good-quality Velcro. I personally like Industrial-Strength Velcro (it’s got SO many uses inside an RV), but any decent quality will do. 1/ Cut off the bottom row of the SKUBB leaving ~2 inches of extra fabric at the top (you’ll have to cut part of the way into the next “row” of shoe pockets). 2/ Cut off the top of the SKUBB (where the hanger is) and remove the flat, corrugated plastic support piece that’s inside. You’ll have to cut into the fabric & tear around the grommets to get it out. 3/ Put fabric glue on the support from #2 (both sides) and fold the top cut edge of the single-row piece from #1 around it. Press to seal. If you want extra support, you can sew the folded ends together too (this is overkill, but if you’re like me you’ll want to do it anyway). You should now have a nice 4-pocket shoe holder with supports both at the top and bottom. 4/ Attach the holder anywhere you please with Velcro. Step 4 -> Install & done! And Voilà….no more mess of shoes in our entrance-way! I’m not the first RVer to worry about where to place our shoes, and I likely won’t be the last either, so I wanted to put a few more ideas out there for folks looking for other alternatives. I reckon this magazine rack from Amazon would work! Shoe Pockets -> Camping World sells a row of Canvas Shoe Pockets ($20) which is a very similar idea to what we implemented, but just in canvas form (instead of polyester). It’s a longer row that’s meant to be installed under your bed (if you have that space open to you), but you could easily hang it anywhere you could fit it. Custom Shoe Cabinets -> Wooden Shoe Cabinets (like this one) look really nice, but take up quite a lot of precious space. If you want to go this route, a better alternative is to custom-make one to fit your particular RV space. There are RV shops who specialize in interior redo’s that can easily do this. Or, if you’re handy enough you can build your own. PVC Pipe Shoe Rack -> Our friends over at Ditching Suburbia made a snazzy little shoe rack out of PVC piping. It’s one of their fav RV mods and they wrote about it HERE. You could also make a similar rack out of wood using inexpensive dowels. Other Wedge-Like Holders -> Pretty much ANY kind of holder with a bit of a wedge-shape (e.g. hanging wall planters, magazine racks etc.) will work for shoes, so as long as you have the space to fit them. So just shop around and think creatively. That’s it for today. Hopefully some useful little tips for those of you who may not have thought of this little mod before. Got any ideas for snazzy shoe storage solutions that I missed? DO feel free to comment below. What?!?! No more pile of shoes on your doormat?? How will we ever find your spot for Nina-Ritas??? Seriously, shoe storage is a major downfall of most RVs. I did sort of a combo of yours and Camping World. Ikea holder cut to one line and then affixed to the end of our bed. But my husband has WIDE…EEEE…feet so his have ended up in a basket at the end of the bed. I suppose I could get a magazine holder for each pair, LOL. Yeah extra wide shoes like that wouldn’t fit in those flat holders, so the baskets are a good idea! The bottom of the bed is a great little spot to store stuff if you have access to it. Because of our bedroom slides we can’t use that space at all (anything along the bed base would obstruct the movement of the slides), so we have to make do with other spots. We have a cabover camper and we used to put our shoes in one of the storage areas that was near the floor and went into the bed of the pick up. The space is pretty cramped and with all the various shoes you were pulling out most of the shoes to find the ones you wanted. Now I only store camper slippers in there and all our other shoes go in a big plastic bucket that we simply set on the dinette cushion while we’re traveling. When we get to our destination, the bucket comes out and if it’s just an overnighter we slide it under the camper outside. If we are staying then we take the shoes out of the bucket and line them up outside on our carpet area just under the rear of the camper. Sometimes the simplest ideas are the best. A bucket works awesome! Cheers for sharing! I miss Ikea. I actually replaced the love seat sofa and RV chair in my 5th wheeler with an Ikea chair and love seat sofa. Ah, shoes. I came up with some shoe storage while doing a modification on my trailer. The step up to the front of the trailer was one step at 10 1/2 inches to get to the 21 inch top. Hard on my old knees. I ripped it out and built two steps (a step at 7 inches and another at 14 inches to get to the 21 inches at the top). I hinged the steps and I can get 4 pair of my taller hiking boots under one step and 4 pair of shorter shoes under the other. Nice idea and re-build of the steps! 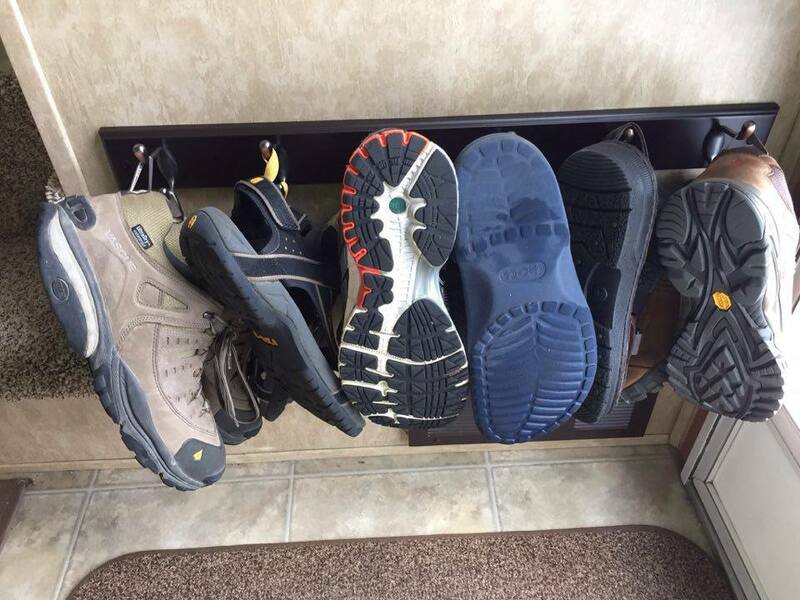 We can’t get under our steps, but I know several folks who are able to use that space in their RVs, and I can totally see it would be perfect for shoes. Cheers for sharing. I have three pairs of shoes: Lems minimal sneakers which are super lightweight and easily folded(I don’t fold them but I could), and two pairs of flip flops, one of which I wear and the other hardly ever. I like the second pair for the dump station because the material is super easy to clean if needed. Anyhow, I actually store them under my cab driver seat. There is a sort of box under the seat where I slip them under easily. I also keep a kitchen container there that I use to trap bugs to take outside. I rarely ever turn my seats around or it might not work as well. Otherwise I sometimes also keep the pair of flip flops I usually wear right by the side or drivers door area. Easy to slip on that way. I’m in a class B so the side door has a pouch in it as well. That works for flip flops or some minimal shoes as does the pouch on the back of the cab seats. Since I mostly wear the one pair- if I’m wearing shoes!- the other two stay under the seat and the flip flops by either door or under the front part of the drivers seat for fast on and off. I just spent about a month at the beach and am somewhat out of the habit of wearing shoes. I, too take them off once inside the RV. We have the Camping World pockets around our bed, but my big 13’s don’t fit in them. One thing we’ve been meaning to try is a multiple coat hook plaque mounted high enough off the floor near the door to hang my Vasque low hikers from the loops on the back of the heels. I think I’ll search your Amazon link for that! Ordered! $19.95. 6 double hooks! Outstanding! I saw something similar to that hook idea on some Pinterest pics I looked at today, but totally forgot to add it to my post. It’s another neat little way to store shoes. Do let us know how they work out for you! So, for those following the comments Diana & Jim (ExploreVistas.com) reported back on their ingenious hook solution. They fit 6 pairs of size 13 on here! What a great idea!! Since downsizing from a MH we can use all the storage ideas possible. Some are so simple you just want to knock yourself on the head!! I have enjoyed and appreciate your post on cameras. Mike just bought a new Nikon 7100 but I think I want the pocket camera….point and shoot. Your pictures and info have been very helpful. Thanks! I always say the best camera is the one you carry with you, and that’s one of the big advantages of having a point and shoot. You can literally slot it anywhere (purse, hiking pants etc) and not really be bothered by carrying it around. Plus they provide pretty good quality too. The mid-level ones are great walk-around cameras while the higher end ones offer many of the manual functions of much fancier SLRs. So, if that’s what you feel comfortable with don’t hesitate to go for it. I still use my point and shoot for 80-90% of my blog pics. Funny Gerri mentions your pictures. I was just thinking this morning about how much I appreciate the amount of work you put into these informational posts with all the great pics. Your scenery ones are always awesome and I get lost in so many of them and these others make life so much simpler. Thanks Nina. Great idea. We do the same thing. Not quite full-timing yet but I am typing this from a rest area in Boron, CA. We’re on our way to Park City for a month of winter camping and skiing. We’ll be staying at Park City RV Resort in our 2003 Airstream 390XL Class A DP. Always love your posts. Stay safe and enjoy the FL warmth. Winter camping! You guys are made of tougher stuff than us. We have several friends who love snow season and will take their rigs to the big snow areas to camp and run the slopes. It takes some planning for insulation and heat, but they love it. I don’t think wimpy me could do it though. Have fun! I can relate to the shoe problem since like you we leave our shoes on the steps or outside. Great ideas, will see which one works for us. Thanks for the tips Nina. I do like the shoe pockets by the passenger seat! That would work really well for flip flops and sandals if those are your shoes of choice. We each have a basket which works but isn’t perfect by any means. Good ideas, Nina! Baskets are so versatile. We have one for Polly’s toys, one for our miscellaneous computer and camera stuff (extra wires, cords, chargers etc.) and of course several for the cats. Plus they are inexpensive and just about every big store (Walmart, Target, IKEA, Marshall’s etc.) sells them. Don’t know why I never thought of one for shoes, but our entryway is rather cramped. I do like that idea too! Thanks for including our approach. I have big feet and the pockets never seemed big enough for my shoes. Our little rack has worked well – the shoes dry out well if wet and and dirt that falls off of them is easily swept up. Totally see that. It’s nice to have that drying option when it’s raining outside, plus I love the fact that your pipe holder can take any-sized shoe. The shoe pockets are a tad on the small size and can be a problem for folks with bigger feet. Very snazzy solution. Size 15! Wowza! His shoes may be the too big for regular shoe pockets, but maybe a basket or hanging magazine rack or something like that would work? Great ideas in this thread:)! Will copy a few of these I’m sure:)! In the closet area, Deb has hung flat shoe storages off the back of the closet, for the 4,690 pairs she only uses once or twice a year… (Well, suppose that number might be exaggerated!). The close still hang well, and as she said – it then leaves her more pole hanging space for clothes (1,234 shirts, 643 pants, 147 sweaters). (Yeah, maybe again an exaggeration:)!) The shoe holder hanging on the back wall of the closet, is fine for most shoes and sandals. But some of the taller walking shoes, with ankle support, will only fit in the bottom row below the shirts. If higher, the clothes do get hung up on them when sliding them around on the pole. Our entry way shoe storage has always seemed to be a work in progress!!! Our current one is a 2″ deep tray, probably 14″ X 20″, that we slide on the drivers floor in front of the pedals. We have the shoe scrapers outside, that we do the shoe scrape dance, before entry. Then Deb’s firm rules are that we sit in the passenger seat and remove our shoes upon entry – and place them in the tray. Really handy when they’re wet. Her only complaint, is that she does not like the first thing for people to see upon entry, are our shoes… But it does not bother me in the least:)! We’ll be adopting some other other ideas here, to work into our ongoing rotational shoe management!!! Good solutions! We bought a very similar shoe organizer to your #2 above (though paid a lot more through Amazon, darn it! ), but we had no short wall to install it on in our motorhome so cut it vertically and hung it just inside the door to one side of the stairs in. We have four rows of two pockets each. We store three pairs of shoes, a pair of my flipflops (both can fit into the same pocket), and newspapers (rolled up) in the final pocket (until we recycle them or use them to protect against paint spills etc. as we’re doing projects). The only negative is that our shoes come in from outdoors and thus, the shoe organizer, which is beige, gets dirty quickly. I am going to try cleaning it with a Magic Eraser, because as we all know, they are magic! We are fortunate to have a very large closet in a small size motorhome. The closet has enough floor space to hold several folding cloth baskets. They are inexpensive and fold flat when not needed. It’s a handy way to organize the (far too many) shoes I bring along. I once asked my husband why he needed so many guitars. “Same reason you need so many shoes,” he said. Ha! At last I understood! I hung a box-type shoe holder on the left side of my closet just like you show, only I put different things in it. The contents vary as I work my way through it, but kitchen towels are a favorite item. Socks and underwear can be compressed so that an enormous number of items can be squeezed into there. I use Bob’s Red Mill grain boxes as dividers, and this works exceptionally well. I also hung up a shoe holder on the back of the closet door and use it to store tee shirts, down booties, flip-flops, and washcloths, plus a few miscellaneous small, lightweight items. The little compression packing cubes can be filled and tucked into drawers or these holders, too. All great tips. Cheers for sharing! For putting things under the bed with a slide out – couldn’t people take things out before and after doing the slide outs? I know that might be a hassle, but feasible to do. I was counting on the under the bed storage to put things such as goose down sleeping bags. Another option for me would be to do a slide out on the other side of the bedroom where the dresser and solar cabinet would be. Would that be ok since that would involve batteries and other electrical connections? I’m just trying to get some more storage space. We have a HR Ambassador which has the same configuration in the front as yours. Where you have your beer next to the steps, we have a 12 inch by 27 inch boot tray with a wire adjustable shelf on top that allows for two rows of shoes (6 pair, three on the wire shelf and three on the boot tray). We have attached shoe bags to the sides of our bed that then slide along with the bed when closing the slide. These are similar to what you have in your closet (possibly a big narrower). They allow for six or seven slots for shoes. This fits under the overhang of the mattress support. We have enjoyed following your posts and have used a number of your campsite recommendations. Yeah that little space near the entrance is an excellent spot for shoes. As you noticed from the pic, it has become our dedicated beer storage spot which means I am NOT allowed to use it for any other purpose LOL. I’ll have to re-look at that side-space by the bed again. For some reason I didn’t think we could fit anything there (because of the slide movement), but if you’ve managed to make it usable we may be able to as well. Cheers for that! I read somewhere whereby the bed is 15 inches above the floor. So that would make around 39 cubic feet of storage space based on a 5 foot wide and 6.25 feet long bed. To take into consideration the slide outs, I was thinking that the drawers could be above where the slide out movement is. This is something that Travel Units would have to tell me exactly how much space underneath the bed I would have after that. I would need a storage cabinet to be close to 3 feet wide for around 42 cubic feet of storage space to replace the loss of storage space underneath the bed if it came down to that. I finally figured out how to put in a couple of storage cabinets in. Now all I have to do is to put the design on algebraic graph paper. Travel Units will have to make a “minor” correction on one of the dimensions probably, but good enough for my purposes. I did read before this post about RV storage space being at a premium and didn’t put that much effort in finding some. Thanks for teaching me a lesson in that I wasn’t taking full advantage of all the space that I had. I hope to go to Novi Michigan RV show this week and take some actual measurements of things. Some dimensions are actually on links such as my refrigerator that I want and the washer/dryer combo. This particular comment has been edited several times at home.